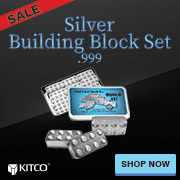 This Silver Cache Kit is available exclusively at Kitco Metals. Given the risks in today’s financial system, it is common sense to prepare. At any time the economy and our lifestyles can change, that is why we believe you have to be prepared for the unexpected. Thus we created this Kitco Silver Cache Kit. Priced at a low premium per ounce of silver over the fluctuating silver spot price, this 250 oz kit is designed and packaged for situation-ready silver preppers. The included silver rounds are struck with a popular Incuse Indian design by the Golden State Mint (a reputable private silver mint). Made of fine .999 silver bullion, each round is stamped with its respective troy ounce weight and .999 fine silver purity providing an easy way to calculate its value. Fulfills various roles: as a defense against price inflations, as a silver investment, for survival and emergency preparedness. Priced better than most 90% junk silver bags, these silver rounds may be easier to barter with should the situation arise. Kitco Silver Cache Kits protective packaging defends your survival silver from moisture and water damage. Every 250 oz Silver Cache Kit includes a hinged-lockable lid. The hard protective black container is water resistant, complete with a tongue and groove design. Compete with a heavy-duty handle which allows for easy carry. Why buy Fractional Silver Bullion items from Kitco? Kitco is a trusted leader in the physical silver bullion and precious metals industry. Silver bullion rounds and other precious metals sold by Kitco are recognized in bullion markets around the world. With our focus on silver bullion, you can benefit from our low silver round prices and premiums that are highly competitive in the industry. At Kitco, we make it easy for you to manage your wealth. You can sell or buy silver rounds and other precious metals using our convenient online store, or by contacting our team of highly trained precious metals specialists. Backed by our global information network, Kitco has been proudly serving our customers since 1977.